Nike Retro Air Jordan 11 Low Cherry Red Size 11 XI White Varsity 528895-102. Condition is Pre-owned but in great shape. Worn less than 5 times. Shipped with USPS Priority Mail. Ships with Original box! NEW IN BOX WITH OUT BOX TOP. The booklet is a little beat up, but the stickers inside the booklet are all fine and excellent shape. AF1 Premium Keychain. Varsity Red/ Black. New in Box. See pictures. Shoes are perfect. -- As much as I try to avoid them, they do rarely happen. Style Number: 312945 412. Color(s): Blue. We provide high quality sports goods such as clothing, shoes, etc. 09 Nike Air Jordan XI 11 Retro SPACE JAM BLACK ROYAL BLUE WHITE 378037-041. BOX ONLY !!!! Pre-owned. Shipped with USPS Priority Mail. Brand new with original box and tags. 100% authentic guaranteed or money back. Returning accepted if buyer pays for shipping and makes sure the sneakers are unworn and in their original condition. When the “Top 3” Air Jordan 1s — a conglomeration of classic “Bred,” “Royal,” and “Chicago” colorways — dropped at the tail end of 2016, they were an almost instantaneous hit, loved for their unique look that straddled the line between brand-new and familiar perfectly. Since then, the “Top 3” has since gone on to become one of Jordan Brand’s most popular non-OG AJ1 colorways, and now it’s appearing again on a brand-new Air Jordan 1 Mid that flips the script on a few details for a fresh new look. Presenting these 100% authentic Nike Air Jordan 1 Retro High top basketball sneakers in men’s size 8.5. These are patent leather and are the rare deep royal Anti Gravity sneakers. These were bought new and worn only 6-7 times and kept clean in a smoke-free home by a sneaker collector. They will be shipped through USPS to the contiguous US States only. Please check out our other Nike and Jordan footwear, clothing and collectible toys for sale! We strive for 100% customer happiness so contact us with any questions. We take our business and feedback seriously so rest assured. Thank you so much for looking and enjoy your day! Without lid New 100% authentic product, box without lid. Ships within 1-2 business days. Shop with confidence. Style Number: 640744 106. We provide high quality sports goods such as clothing, shoes, etc. Color(s): White. Air Jordan 11 Retro XI 72-10 Size 9 PRE-OWNED 100% AUTHENTIC. Condition is Pre-owned. Shipped with USPS Priority Mail. Will not ship outside United States. Returns are not accepted so make sure you are serious and ok with shoe condition before purchasing. COLOR: WHITE/BLACK-DARK CONCORD. NIKE JORDAN 6 RINGS BASKETBALL SHOE. Nike Air Force 1 Low Premium. Nike Air Jordan 4 IV rertro 12 Lab 4 Black Pedant leather size 14 sneakers in pre-owed condition with normal wear,shoes show some scuff marks and a stretch mark on side lower side, other wise in good pre-owed condition. Please review all photos before placing your bid any questions please feel free to ask and I will try to answer them to the best of my ability. Winning bidder must pay for item within two days of winning. Customer satisfaction is always my first goal any questions or concerns please contact me before leaving any feedback. Thanks and good luck bidding. Nike Air Jordan 11 72-10 Retro XI 378037 002 US MENS SIZE 9. Condition is Pre-owned. Shipped with USPS Priority Mail. 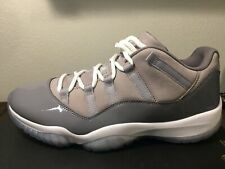 Nike Air Jordan 11 Retro Low Basketball Shoes New In Original Box. University Of North Carolina Colors. Excellent Quality Shoe Exceeds Ordinary Basketball Shoes. Foot Locker Receipt Included. The lid from the box has been removed from the box. NO EXCEPTIONS. I will do everything I can to correct the situation. Item Number: 528895-106.